If large branches of your mature boxwood turn orange or tan, the plant is likely suffering from boxwood decline. What is this? Boxwood decline in shrubs is a disorder caused by plant stress and fungal diseases. Read on to learn about boxwood decline symptoms and tips for managing boxwood decline. 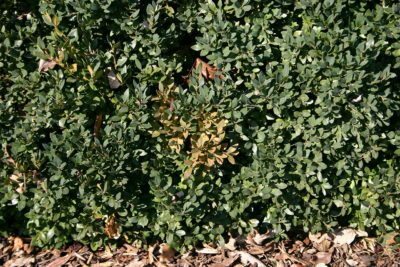 If your boxwood shrubs are suffering from stress – like improper pruning, inadequate drainage or cold injury – they may contract boxwood decline. 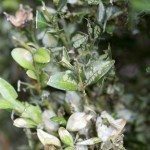 This disorder can discolor and damage your mature plants. 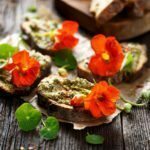 It can be caused by the fungus Macrophoma, which causes the oldest foliage to turn yellow. If you look closely, you can see small black dots on the dead leaves. 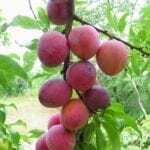 These are the fruiting structures. Boxwood decline in shrubs can also be caused by the fungus Volutella. It creates orange-pink fruiting structures on boxwood branches when the weather is wet and warm. Boxwood decline attacks older boxwoods, those 20 years old or more. It usually occurs after the plant has suffered some stress, like winter injury, poor pruning or excess water in the soil. When you look for boxwood decline symptoms, keep an eye out for discolored stems and foliage. The stem discoloration can be continuous but it isn’t always. Sections of the foliage of infected boxwoods will turn light green. In time, the foliage turns yellow and then fades to tan. Treating boxwood decline starts with prevention. Make every effort to keep your plants vigorous and healthy. Be sure they get sufficient water on a regular basis and that their roots have excellent drainage. Avoid circumstances that stress the plants. Make sure excessive mulch isn’t layered over their root zone. If construction is occurring nearby, take care that the boxwood roots are not injured or the soil compacted. Keep the boxwood free from insect infestation. One of the causes for die-back diseases like boxwood decline is crowded growth in the branch crotches. They create humidity in the boxwood canopy. Managing boxwood decline should include allowing air and light into the center of the shrub. If you see discolored or withered leaves, remove them by shaking the plants gently then picking out the dead foliage. Prune out dead and dying branches, which also thins out the center of the plant.